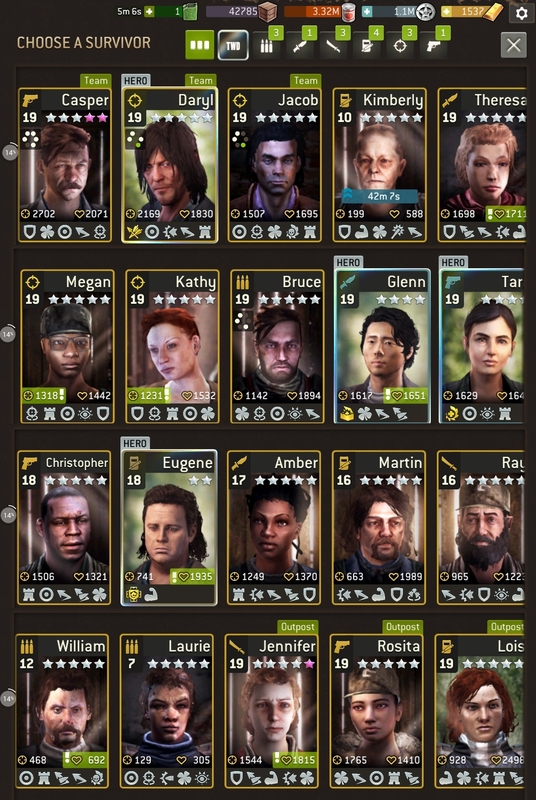 Please have a look on image below and leave you opinion on whom should I upgrade to Pink family :> Thanks! If it were my roster, no-one. Keep making calls to get even better combinations of traits. The rest I really can't find anyone that I would invest further in I'm afraid. But I'm not the best strategist, so may not be the best advisor here either. Witht he exception of those that already have pink stars, they are very nice! I do, and I love it. (Except, don't take them on maps with Kaboombies. So better have some without revenge if you want to use them on those maps). What survivors, if not all, does revenge work best on? Ranged (shooter, hunter and assault). Personally I love it on shooter and hunter. It gives me the feeling that my survivors tell the walkers to stay the f- away from my buddies. But the assault is fine too, though I'd prefer it combined with ruthless in an assault, since they are less powerful and can use that boost. Yeah, for hunters I have lots of tokens for hunter and was not sure if Jacob or Kathy are worth it. Thanks all.